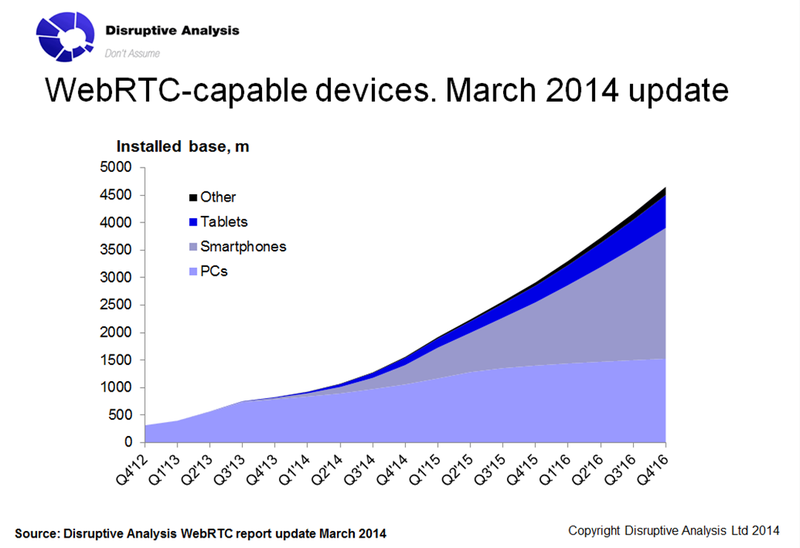 Disruptive Analysis has been covering WebRTC since June 2011. And it is now just past the one-year point since it published the industry's first comprehensive analyst study and forecast covering the entire WebRTC value chain, in February 2013. Comprehensive update documents were issued to subscribers in June & October 2013. The third revision has now been published, covering recent trends in use-cases, standards evolution and WebRTC industry structure - as well as updated forecasts. Over the last year, a few other analyst reports have been published on WebRTC. But none has really covered all aspects - enterprise, telecoms, consumer web beyond, with both qualitative and quantitative input. Much of what has emerged has stuck to the original 2011-2012 narrative about WebRTC as being just "like Skype but in the browser", rather than examine how WebRTC is changing into a much broader set of propositions. In the October 2013 update, Disruptive Analysis identified the trend towards non-browser WebRTC, especially on mobile devices. This has accelerated and is now an undeniable part of the landscape. Indeed, it is the core driver of recent headline service launches, including the consumer-oriented Tuenti and WeCam launches just this week, as well as the B2C customer-service interactions seen in Amazon's Mayday (which is part-WebRTC) and American Express' new iPad app enabled with video-chat. These developments reflect both positives and negatives about WebRTC's evolution. At one level, there are issues with the lack of IE/Safari support, and continued debate over video codecs. Security and firewall/network middle-box traversal (in some instances) remain issues being addressed by IETF. But what offsets these problems is the large and growing emphasis on "getting on with it anyway", in pre-standard form, and often using cloud platforms and 3rd-party SDKs to embed WebRTC into mobile apps, standalone PC applications and yes, even plug-ins. This is inevitably slowing down some use-cases, while speeding up others. This translates into some modestly-lowered forecasts for PC support and adoption of WebRTC in 2014, but increased mobile support, especially from 2015. That is underpinned by both a growing array of "WebRTC cloud enablement" providers such as Tokbox, Twilio, Weemo, Temasys and about a dozen others, as well as a sudden surge in native or browser-based support of WebRTC on Android. By the end of this year, a large % of new Android devices (phone and tablets) will ship WebRTC-enabled "out of the box" - some in multiple different ways. In the consumer space, it seems that mobile/social adoption of WebRTC is finally starting to occur, but primarily on mobile rather than desktop. To a degree this reflects both browser-support issues, but also means that efforts are concentrated around the hot-as-the-sun communications app space. The Viber and Whatsapp acquisitions have just turned the focus on the area that WebRTC was heading towards anyway. 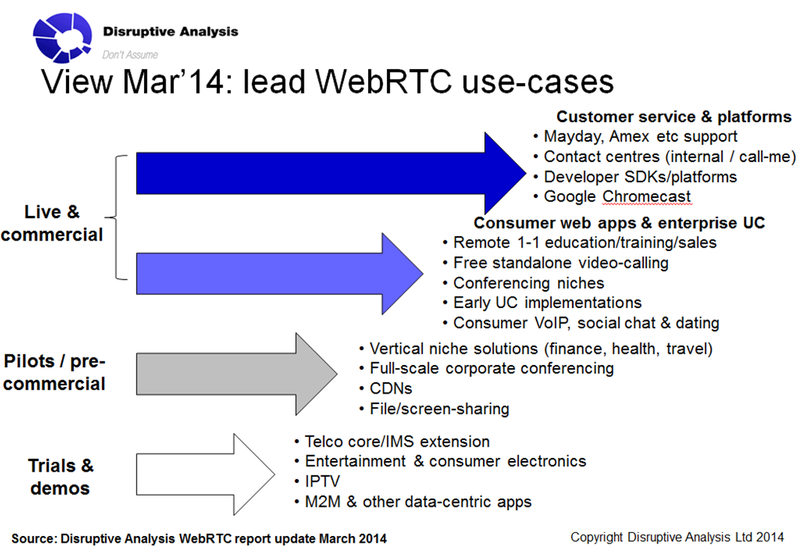 Disruptive Analysis expects quite a lot more consumer-centric WebRTC apps to appear this year. It would be unsurprising if at least one "went viral". This could bring 10's or even 100's of millions of users overnight, dragging 1000's more developers in its wake trying to emulate it. There are also interesting desktop uses of WebRTC, including video-chat, but also extending towards defined verticals, such as healthcare and other forms of online consultation. As predicted, telco use-cases of WebRTC have been slow to become real, especially where network-integration work with IMS is concerned. Although 3GPP is working on standardisation and a number of vendors have announced contracts, it seems likely that “live” commercial services will suffer protracted development, testing and internal-process cycles before launch. Most mobile operators have enough problems simply getting VoLTE to work in normal fashion, and so WebRTC enhancement or extension is not a priority. RCS is another "problem child". Those telco-related WebRTC efforts which have emerged into the light of day so far – a total of 4 by Disruptive Analysis’ count – are solidly in the “OTT” camp at present, including developer platforms. That said, there is clear interest from the service provider community, based on announcements, conference and web appearances of telco representatives, and Disruptive Analysis’ own report sales and consulting engagements into that sector. Other service providers from background such as VoIP and web-hosting are starting to appear as well. As well as the established use-cases, other WebRTC domains such as the data-channel CDNs discussed recently, as well as Google's Chromecast dongle, are also starting to get traction. It seems likely that the overall market will continue to expand in scope as well as scale. Additional detail and methodology/assumptions is available to the report's subscribers in the full document. Charts are available for companies wishing to use the data in presentations or marketing material, subject to sourcing to the Disruptive Analysis WebRTC Report. New customers buying the WebRTC study will receive both the original report and this March 2014 update, plus an hour's conference-call to discuss the current state of the market. Additional ongoing subscription packages and/or briefings and workshops are also available. Tuenti, Telefonica, Tokbox and zero-rated Mobile WebRTC? This is a quick post on what appears to be a very interesting development I've stumbled upon today. It appears that a division of Telefonica has both a Telco-OTT WebRTC-powered VoIP service... and is also zero-rating it for use on its own MVNO-style sub-brand network service. This is from Tuenti, a Spanish social network that TF acquired some time ago. Although it has faced heavy competition & cannibalisation from Facebook, it still has around 6-10m active users, mostly in Spain. I haven't had a chance to confirm this with the company yet, so various caveats apply, but... this blog post on Tuenti is very telling. It appears that Tuenti has had a Telco-OTT VoIP app for some time, but now "the VoIP service is compatible for the first time with the web (using the Chrome browser)". Or, according to the FAQ it works for calls to a PC which is using Chrome v23 & up, or Opera v20 & up. Which, coupled with the screenshots on the FAQ, screams "WebRTC" to me. If I'm reading it right, it also appears to work as a messaging client for broadcast, buddy-list and one-to-one modes - ie like Twitter, Facebook Status or SMS. The other wrinkle here is that Tuenti isn't just a Telco-OTT social network. It also operates as a prepaid SIM-only MVNO called Tuenti Movil in Spain, which had around 165k subscribers at the end of last year. More interesting still, it has a dataplan called Zerolimites, which zero-rates use of Tuenti's own app, if used on its own network - even if the user has no credit, for up to 30 days. Like GiffGaff in the UK, Tuenti appears to be a subsidiary MVNO, owned by a full MNO. I guess that potentially it puts it in a different place from a regulatory point of view as well as for branding purposes, depending on the "Chinese Walls". I haven't really seen anyone talk about how Net Neutrality might work for MVNOs, either. There's multiple angles here, which I need to think about and ideally talk directly to those involved to confirm. I don't know, but I could easily imagine the new version of the Tuenti Android app is based on WebRTC APIs from Telefonica sister-company Tokbox. I'm not sure how the on-net traffic is zero-rated - perhaps by forcing it through a TURN server rather than doing it all P2P? There's no iPhone version, but I suspect that's because of Android's dominance in Spain, especially among the cash-strapped youth demographic aimed for by Tuenti. I want to get a chance to drill into this in more detail, but at first glance it seems to be one of the best examples of Telco-OTT innovation I've seen. (Honourable mention to Orange's new version of Libon too though, with its browser-based "guest access" mode). involvement, mobile WebRTC, and whether the slow arrival of Microsoft & Apple is a problem. Tuenti's announcement also comes hard on the heels of yesterday's launch of another mobile WebRTC app called WeCam for social video-chat between Facebook, Google+ and Twitter users, which is openly disclosed as being powered by Tokbox. Together with various other factors and announcements I'm aware of, I am now increasingly convinced that mobile variants of WebRTC are going to hit an inflection point in 2014, not 2015 as I'd originally expected. More detail on the analysis is exclusively available for my subscribers. Disruptive Analysis was the first analyst firm covering WebRTC, and maintains the most comprehensive & up-to-date analysis of any research house. If you're interested in buying the Disruptive Analysis WebRTC research study (including the new update) please click here or email information AT disruptive-analysis DOT com . Private workshops, webinars and consulting work also undertaken. (I'm also working on a report on "Non-Neutral Mobile Internet Business Models" for publication in the next month or so - get in touch for a pre-publication discount). AT&T is rapidly becoming the Internet's Public Enemy #1. Its sponsored data API programme is sufficiently misguided that it is fairly harmless. It has virtually no chance of achieving what it sets out to do, as I explained in this blog post last month. It also sets itself on the "right side" of Net Neutrality quite carefully, by avoiding any reference to possible differential treatment of traffic. It is just aimed at differential pricing - more specifically, zero-rating certain websites and maybe apps, by having the "upstream" provider pick up the tab. What I've found unclear was whether this is the top of a slippery slope, or more of a sacrificial lamb to be offered up & killed in exchange for other regulatory favours. The last few days, however, have suggested that the slope is indeed slippery, the wedge thickening, and the iceberg's tip being exposed beneath the surface. In response to a blog post about Net Neutrality by Netflix's CEO (which is also rather bombastic, to be fair), AT&T's public policy team have decided to come back with guns blazing. Having had a bit of Twitter banter with their team, I've gone through the details in more depth below. But in a nutshell, AT&T has responded with a disproportionate and largely illogical diatribe that doesn't even bear scrutiny from the perspective of "rational anti-neutrality". It has then further compounded it with a frankly unbelievable filing suggesting that allowing paid discrimination/prioritisation is a way to further Internet competition, not restrict it - and lower subscribers' costs at the same time. But back to AT&T. The main thrust of its argument is that non-Netflix users are effectively subsidising the Netflix users, by bearing the extra cost of peering and/or other elements of infrastructure. At least that's what I infer, after working through this bizarre tautology: "faster broadband networks like our Gigapower service... are requiring all service providers to drive more fiber into their networks". I read that as "our fast network means we have to deploy fiber", which is rather self-evident. Personally, I'd say that if you deploy fast networks, it shouldn't come as a surprise that bandwidth consumption rises as a result. And also, the effects have positive feedback - faster networks drive more/richer video use, which drives deployment of faster & higher-capacity networks. It was ever thus. Hence we've moved on from dial-up modems to fibre, while at the same time more people buy broadband, and keep paying for it. In common with many industries (computers, cars, travel) we are conditioned to pay the same or lower prices for continually-better products. AT&T then goes on to say "we should accept that companies must build additional capacity to handle this traffic. If Netflix was delivering, for example, 10 Terabytes of data in 2012 and increased demand causes them to deliver 20 Terabytes of data in 2013, they will have to build, or hire someone to build, the capacity necessary". My initial reaction was "...and your point is?". Netflix does build extra capacity - more servers, more data centres, bigger connections as its end of the Internet, more CDN capacity, more transit if needed. Same with all Internet companies. At the same time, end-users on AT&T's network are buying faster connections, and are subject to usage caps. It should not really matter to AT&T whether a user's paid-for usage, below its cap of 250GB (or whatever) comes mostly from one set of servers, or a hundred different ones. If my tax contains an element to deal with road maintenance, the government doesn't complain that I always drive to the same place, rather than a random bunch of irregular destinations. AT&T should know that if it offers and sells more broadband capacity to its customers, then it's going to have to buy some more peering capacity and ports to support it. Surely, it's been selling broadband Internet access long enough now, to realise that dimensioning applies to both ends of its network. Now to be fair, I think Netflix oversteps the mark as well. It basically describes paid-peering as a necessary evil (I paraphrase) which it would like to outlaw. Well, yes, I expect it would - but that's also part of the nature of the Internet, as described by the redoubtable @internetthought in this document by the OECD. What I think Netflix should have aimed for is not the elimination of paid peering, but something closer to regulatory or competitive requirements for it to be priced in a way that is fair, reasonable, transparent and non-discriminatory. What would be unreasonable would be for Netflix's paid peering to be significantly higher than anyone else's for the same capacity (Dropbox, Google, or other telcos like Verizon or Telefonica). Hastings makes some good points about asymmetry and free peering between telcos, as well as the risk of termination monopolies, especially in markets with limited retail broadband competition. (Yes, the US has ridiculously little competition, because its equivalent of local-loop unbundling & CLECs proved disfunctional, and there is no obligation on cable companies to offer wholesale propositions). AT&T's most egregious argument is that non-Netflix users end up paying to subsidise non-Netflix users. It talks about the postage it paid to send movies in the past, when it shipped DVDs - the same sort of 19th-century "delivery" metaphor it tries to apply with sponsored data. But the metaphor is flawed. The postal service doesn't have an "access" model where every household subscribes. It doesn't have the same structure as the web, with data being requested, adaptive applications, mashups, bi-directional interactive flows and so on. That's the way the Internet works - there's millions of sites, and we all pay to be able to access all of them. Inevitably, there's a lot of stuff that any one person doesn't access, but others do. Drawing an analogy with the mail is ridiculous. It's a logical fallacy, a strawman. In fact, AT&T commits a good proportion of the logical fallacies outlined on this great website in its pronouncements. (And yeah, I know I used the "slippery slope" myself). Let's scale this down a bit. Both I & my customers are bearing costs for people accessing other analysts' websites and buying their research (boo, hiss). And much as I'd like Gartner or Forrester or Informa to stump up some extra cash to save my clients some money, I accept that's not a realistic - or fair - suggestion on my part. I benefit hugely from the open Internet - this blog, Twitter, Paypal, LinkedIn, Google and so on help me run my business - and it's in my interest to ensure that innovation continues. The bottom line is that the position is irrational. "If there’s a cost of delivering Mr. Hastings’s movies at the quality level he desires – and there is – then it should be borne by Netflix and recovered in the price of its service". AT&T: get this through your collective heads - the Internet does not "deliver" stuff. Data traffic is not physical, so stop using physical terminology. Your electricity connection doesn't "deliver" electrons. There is a cost to Netflix of connecting to the Internet. There is a cost to your subscribers of connecting to the Internet, which includes both last-mile access and your implicit commitment to effectively connect to all the other bits of the Internet. Even bits you don't like. That's what you're being paid for. Now yes, there may be specific instances where it's in two Internet peers mutual interest to pay reasonable fees to expedite something. But framing that discussion in terms of "free lunches" harks back to the hyperbolic SBC-era tripe of "you can't use our pipes for free". And sure, Netflix is overstepping the mark too with its wishful thinking that all peering, everywhere is going to be done on a handshake. But instead of just arguing that Netflix should look at the structure of the Internet and accept that sometimes (small & reasonable) payments will occur, you've tried to expand the argument onto spurious grounds of fairness to non-Netflix subscribers. And as for your risible argument about "allowing individualized dealings between ISPs and edge providers", the idea that it will "empower startups" is so patently flawed I'm worried that you might actually believe it yourselves, rather than just having it as a lobbying position. Think about this for a moment. Are you expecting wholesale prices for such content providers to be higher than end-users' retail prices for capacity? Have you spoken to any startups willing to pay? Under what conditions? Seems unlikely to me. If I'm buying a few petabytes, I want them at much lower prices than end-customers buying gigabytes. Which suggests a less-than-zero sum game, if it does indeed "reduce the cost of broadband service for consumers" as you claim. Unless you're not intending to pass on infrastructure upgrade cost-savings, I can't see why you wouldn't lose money here. Plus, nobody will pay you money for priority when the network is uncongested unless you threaten to downgrade them, or engineer the network so it's always congested. The bottom line of all of this is probably unpalatable. Neutrality is almost certainly the least-worst option for AT&T and other ISPs, unless you are allowed by regulators to charge unreasonable peering fees for monopolistic access to your customer base. Your attempts to undermine the existing competitive structures of the Internet with differential access-network performance are actively dangerous and insidious. By all means set up a parallel ecosystem and disrupt from adjacency, but experimenting with unproven business models on a "live" and critical platform for global innovation and productivity is unacceptable. Not only that, but you are also ignoring risks to your own business that will result from playing "silly games". Your own website & OTT-style services will be first in line for mistreatment by your rivals. You are likely to provoke a mass switch to encryption, proxying and numerous new and exciting forms of arbitrage.You incentivise Netflix to offer "free TB of backup" or other apps, to create symmetrical or opposite flows, with you "delivering" data to it and creating further congestion/costs. You appear to be promoting a model that will replace (profitable) retail revenue with bulk wholesale deals. And above all, you are making your company appear as a threat to both the Internet and consumers' and businesses interests (and possible society as a whole). As a major US & global telecoms firm, you're too important to be allowed to commit euthanasia through non-neutrality. If you're being serious here, the FCC needs to treat you as if you're a danger to both yourself and others, and regulate accordingly. Or alternatively, just tone down the rhetoric and start making constructive comments rather than issuing irrational polemics. (And sure, accuse me of hypocrisy if you can find anything particularly irrational here. I like to think I specialise in rational vitriol). Edit: Oh, and Netflix / Mr Hastings - I think you need to retune this "strong neutrality" message. Paid peering has been around for longer than you, and if handled appropriately is both equitable and doesn't require the extra bureaucracy of oversight. Argue for "FRAND" peering, rather than wishfully thinking that it should all be free. Just how disruptive are WebRTC CDNs? Either to established players, or to mobile networks? The bit of WebRTC which everyone outside the industry tends to overlook is the datachannel, partly because it doesn't fit with the popular - but wrong - view that that WebRTC is just "Skype in your browser". WebRTC is neither just about voice/video calls, nor just about browsers. Instead, I've been thinking closely about some of the datachannel use-cases I've been seeing. Probably the most-common is file/screen-sharing, typically alongside various types of conferencing functionality. While there's a few interesting sub-categorisations (co-browsing, shared whiteboards etc) most are fairly intuitive replications or extensions of tools seen on other VoIP or video diallers and conferencing/UC tools. But the other category that stands out is that of WebRTC-based CDNs (content delivery networks). I wrote about Yahoo's acquisition of PeerCDN in December, which provided an early heads-up about this model. It replaces part of the normal way websites and apps get content from servers owned by Akamai, Limelight etc (or a telco on-net CDN) with a peer-to-peer exchange of data directly between users. Since then, a couple of things have happened. Firstly, two more WebRTC CDN players have emerged that I'm aware of - SwarmCDN and Viblast, as well as Peer5 and Streamroot, which I referenced in December. All are small companies, but, interestingly, already have a business model based on the amount of traffic diverted away from the other mainstream CDNs. The other thing has been the much-ballyhooed deal between NetFlix and Comcast, which many people wrongly put down to non-neutral "sender pays" models or prioritisation, but which in fact nothing of the sort. It is a paid-peering deal that just clears a bottleneck between one of NetFlix's CDN providers, and Comcast's network, by means of NetFlix connecting directly at various IXP locations. (Sidenote: fantastic explanation here - ignore all the shrill-but-ignorant political commentary, as this is nothing to do with actual, all-important and valid Neutrality). Potentially the WebRTC approach suggests that content delivery costs (to the provider/broadcaster) could be driven down substantially. And the peering issue hightens the rationale for looking into ways to save costs sooner, and in more disruptive/innovative fashion. Linked to this are reports that some CDN players - notably Google - are having to pay to install their servers in some telcos' networks. I'm starting to tip towards the newer P2P-CDN approach as viable, initially at least for content forms that might be free/low-revenue bearing, rather than premium streaming. I'd expect that some broadcast organisations like the BBC will do their own research and maybe build in-house tools as well. And given its parentage, it certainly wouldn't surprise me if YouTube takes a good look as well, especially for its newer live-streaming and Hangouts-on-Air products. This domain also might be where to locate the worryingly-absent adult industry in WebRTC (worrying because normally it's at the front of the queue for cool new web technologies, yet bafflingly seems quite invisible in WebRTC thus far). There's even a possibility that telcos/ISPs might benefit in some ways, from reduced load on their transit/peering, improved video performance experienced by customers, and maybe even hosting bits of WebRTC infrastructure like TURN servers on a localised basis. (China Mobile's take on the latter is here). But the other side to all this is perhaps less-rosy. Like other, less-legitimate uses of P2P such as illegal file-sharing, this type of browser-CDN/app-CDN approach generates incremental upstream traffic. Data flows "up" from one user, "across" the network, and then "down" to the other user. Of course, it's also already been transmitted "down" to the first user to start all this off in the first place. Generally, uplink capacity is much more constrained than downlink, especially on mobile networks. It also consumes lots of battery from mobile devices as sending is clearly more energy-intense than receiving. It also potentially increases costs to the end-user, assuming that the volumes are meaningful in the context of a data cap or quota. (And also assuming that the network actually measures upstream data transmission as well as downlink). The question is what can/should/should not be done about this. It's not obvious that policy management and in-network DPI can do much about browser/app-CDNs using WebRTC specifically. Apart from anything, it's encrypted - so unless telcos try to block all P2P WebRTC, it will be hard to discriminate CDN-type traffic from filesharing or screensharing or 100 other more "legitimate" things.The growing volume of enterprise WebRTC traffic, in advance of most consumer applications, suggests that such a blanket policy intervention would be badly-received and possibly illegal. There are also options for networks to try to charge differentially for upstream and downstream traffic, but that is likely to lead to huge user confusion and dissatisfaction as it will also impact photo uploads, sending emails etc. Overall, at the moment I suspect that neither the policy vendors, nor the broadband operations folk at most operators, have identified WebRTC-CDN as a possible traffic type or significant disruptor. It will be interesting to see what happens if and when it explodes - which could well happen overnight, for example if a common website starts using it suddenly. It would also not be surprising to me if we see Akamai, or other established CDNs, also looking into P2P approaches as a value-added service, or cost-mitigation approach for their customers. We could even see some of this working between network-resident web caches, rather than proprietary protocols. As a thought experiment, consider distributed SDN-based cacheing, with low-latency P2P datachannel connections, spread throughout a mobile network, and perhaps even co-located with base stations. Overall, I continue to believe that the datachannel is ultimately going to be the most disruptive part of WebRTC, which might change the way networks and applications are built and operated. The original versions of P2P had a huge impact, but more mostly illicit. This time around, P2P is going to go mainstream and be legitimised, courtesy of WebRTC. One takeout from this is that WebRTC datachannel p2P application developers should think about collecting performance statistics from Day 1. This will allow any subsequent attempts to throttle, deliberately degrade or limit connections to be more easily-spotted at a later date. When two people want to arrange a meeting, an interesting social negotiation occurs. Do you meet at one person's office, the other's, a convenient cafe, a hotel lobby, or at an event? Who initially suggests the time and the format? Who decides whether to invite other people to the meeting as well? Numerous factors determine the choice. Is one person travelling? Does someone work from home rather than an office? Which has the busiest schedule and the least time to go out? Who requested the meeting? .... and, perhaps the most important: who has the most power and influence in the interaction? If you're a salesman, you'll probably go to your client's site. If you're friends, you might meet over lunch, somewhere convenient. If you're an employee, you'll go to your boss' office. It's a blend of power-dynamics, pragmatism and context. Who's got the money, the influence, or the persuasive capabilities? Or the best coffee machine? It's much the same, but more subtle, in personal relationships as well. Who goes to whose house? Who's the inviter vs. invitee? On a date, do you choose "neutral ground"? Whose choice of restaurant or bar? Again, it's a complex, fluid social interaction. But in communications, we've never really had the same situation historically. You phone each other, perhaps arranging via email in advance. In a social context, we've also called or maybe SMS'd. But this misses a lot of the richness (and unpredictability) of normal human social interaction. It gives the caller unnatural power over the callee - the ability to interrupt, for example. You always meet on "neutral ground" - that of the E164 number and the inter-operated phone network. But this doesn't recognise the normal power-dynamics or context. For example, I recently got a "pitch" call from an agency representing an industry association, for a briefing at MWC, which I was not attending. This unsolicited call, while I was roaming, had a withheld number. It interrupted me, and cost me money to answer an unwanted and irrelevant call, as I had no idea of its purpose. The much-vaunted universal "reachability" of the PSTN and mobile telephony was a liability, not an asset, in that instance. In a B2B context, these issues occur regularly. I regularly get offered briefing calls by vendors. Often, they require me to use a US dial-in number, or install a browser plug-in for a web-conferencing call. That's fine if it's a paying client or prospect - they're the ones with the money and I want their business. But if it's just a random briefing requested by a PR/AR representative, then the power-dynamic shifts. I've started to insist on vendors contacting me on Skype (free, and I can use a headset & type my notes easily). I'm fed up with clunky plug-ins that need me to "check configuration 15 minutes before the call". I want an emailed PDF/PPT rather than a "driven" web-presentation so I can look ahead and see which slides I want to spend most time on, skipping waffly preamble if I'm time-constrained. Typically, I don't want to do video, as I am an unapologetic multi-tasker. In other words, I'm starting to use the power-dynamics to my advantage and preference, albeit accommodating of others' needs "by negotiation" - for example, where corporate firewalls or policies prevent dialling UK numbers or using Skype. I don't want to be an arrogant "don't you know who I am?" boor, but at the same time I see no problem in using my preferences as a starting-point. However, at the moment I don't have a "conferencing service" that I use regularly myself, nor an easy way to record calls, so normally I'll run with whatever someone else suggests. In a personal context, the dynamic changes again. I use a mix of email, phone, Skype, WhatsApp, SMS/iMessage & Facebook to communicate with my friends. I know that some of them are Facebook refuseniks and so pick other channels. I know some friends always have phones on silent or buried in their bags. They in turn know that I'm often travelling, and generally dislike unexpected phone calls. Some of them tend to send lots of photos or like messaging stickers. Some are overseas and neither of us want to incur international charges. Sometimes I speak to someone who's pseudonymous, or where I don't want to use my normal phone number (eg B2C interactions where I don't want to get SMS spam). Again, there's a social negotiation involved, with a side-order of pragmatism, tolerance or sometimes just pure showing-off. It involves persuasion - for example, various friends use Instagram, but I don't, yet. I might in future. Or I might not. Let's see - I might just try it if enough of them hassle me. It's human. All this is going to get much more complicated in future. I don't think sociologists or anthropologists have really tackled this area yet, but it's going to be interesting to watch. It's also something that technologists fail to grasp - especially those on standards bodies, for whom ubiquity, interoperability and "reachability" seem to be paramount. But that's not the way real people interact, in real life. We're driven by fashion, convenience, inertia, power, prejudice, taste, context and lifestyle. We're also increasingly empowered to exercise our preferences. The simplicity of downloading and using a mobile app (be it "OTT" or "Telco-OTT" or embedded in the device) gives near-instantaneous choices. It also makes it much easier to push our choices upon other people. WebRTC will take this a stage further again. Firstly, it makes it easier for people to find tools that suit them. Maybe I'd prefer video if the UI was better? Maybe I'll invite vendors wanting to brief me to my inbound presentation-management platform where I drive the slide-deck, or can flip through it offline in a separate window. Maybe I want to record the interaction, or tag it, or have someone else listen in? Maybe I want to give "guest access" to an enterprise system via a browser? Or trial something? Maybe I just want to "cut the number" and move to a URL as my primary communication identifier? Of course, WebRTC is democratising, in that both sides of an interaction can exploit it. But my sense is that it, along with a continued rise in the use of mobile apps, a lot more of the normal social power-dynamics will be brought into day-to-day communications. It will also be interesting to see how companies respond to this. I see no reason why I should give people my phone number, if I prefer something else. If I'm the customer, and I'm paying you money, then you should contact me on my terms. Web forms will start to evolve to having pull-down menus with a choice of preferences, rather than trying to mandate an E164 phone number. We already have direct-marketing preferences and opt-outs (email vs. SMS vs. post), and I suspect that will extend to voice, video and IM connectivity in future as well. I'm sure we'll hear howls of complaint from the standards-mongers bemoaning the lack of ubiquity, and the risk of "walled gardens". But they're probably the same people who insist people come to their (walled) offices for a meeting. If you disagree with this post, you're most welcome to have a chat about it. In my local cafe. Or via Skype, or in a WebRTC meeting-room of my choosing. Unless you're a favoured colleague/contact, or pay me a ton of money, in which case it's your call.